The BJP has elevated a number of controversial politicians to its central ranks, giving a preview of upcoming elections. Last week the opposition Bharatiya Janata Party (BJP) reconstituted its highest decision making body, parliamentary board and central election committee, which will define the party’s agenda and choose its candidates for next year’s elections. 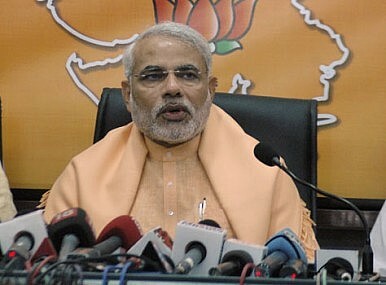 That Gujarat Chief Minister Narendra Modi would be elected to both bodies was a foregone conclusion. The team constituted under the leadership of the party’s new president Rajnath Singh, has clearly given its stamp of approval to Narendra Modi, the most popular leader from the rightist Hindutva party today. Many were surprised, however, by the appointments of Amit Shah, Varun Gandhi and Uma Bharati. Amit Shah, for one, was arrested for his connection to the case of terrorist Sohrabuddin Sheikh in July 2010. After spending a few months in prison, the Supreme Court debarred him from entering his home state of Gujarat for almost a year. Varun Gandhi, who shares his surname with his first cousin and Indian National Congress Vice-President Rahul Gandhi, was recently exonerated for giving a hate speech against the India’s Muslim minority during his 2009 election campaign in India’s eastern state of Uttar Pradesh. In his speech, which earned him a few weeks in jail, he threatened to chop off the hands of anyone who harmed members of India’s Hindu majority. Uma Bharati, a rabble rouser known for her radical Hindutva ideology, was one the main campaigners for the demolition of the 16th century Babri Masjid mosque in 1992. The communal riots ignited by the destruction of this important religious site claimed more than 2,000 lives, according a 2009 parliamentary report. At the time of the report, Bharati remained unapologetic for her role in the affair. What message do these names send to Indian voters prior to a crucial election year? By bringing these controversial figures into its core committees, the opposition appears to be reviving the old Hindutva agenda once again. Their motive is clear: to once again consolidate the core Hindu voting bloc and polarize electorates – a strategy that worked in the past. It is no coincidence that on the same day the BJP was reshuffling its core organizational bodies, Mohan Bhagwat, chief of the Rashtriya Swayamsevak Sangh (RSS), the BJP’s ideological fountainhead, called for the construction of a Ram temple. Meanwhile, Dr. Pravin Togadia, a leader from the Vishwa Hindu Parishad (VHP), a radical arm of the RSS, announced from a public platform in Ahmedabad that by 2015 Gujarat would be declared a Hindu state. Some political analysts say that the BJP will test its Hindutva agenda in the four state elections that are to take place this year, where the party is in direct opposition to the Congress. But it remains to be seen if the results will carry over to the elections in 2014. It was widely expected that the opposition will corner the Congress-led United Progressive Alliance government in the coming assembly elections and general elections by showcasing its own model of economic development. But that seems more uncertain now given the recent ascension of radical elements within the party’s hierarchy. By giving a prime place to Modi, the BJP demonstrates a lack of confidence in its ability to win elections with a progressive economic and political agenda.